So, what is a mint julep? Simply: a drink of cognac, whiskey, or rum; sweetened with sugar, iced and flavored with fresh spearmint. A highly ritualistic tipple, I’ll leave you to judge which is best. 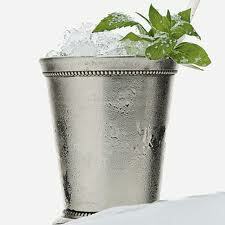 In a pre-chilled glass or julep cup, add the syrup and mint leaves. Muddle lightly, just to release the oils. Discard the bruised mint, half pack the glass with crushed ice, pour on the base spirit, stir to chill and top with more crushed ice. Garnish with a bunch of fresh spearmint, stems cut up to the leaves.